grandma's cookie jar: Shine from Go Fish . . . I'm Giving One CD Away! On several occasions I've had the opportunity to review and give-away music from Go Fish . . . I'm happy to say today is another occasion for me to do this! 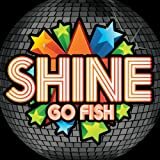 Go Fish has a new CD which goes along with their 2014 VBS; Shine! The great thing about this music is it is filled with songs your grandchildren will LOVE and want to sing at your home and at their own! CD has six songs with solid messages, music with "pep" and tunes children - and grandparents will love . . . Shine . . . "Shine like a star in the night Make the whole earth bright When you shine your light It's time to Shine Let the whole world see A brand new you A brand new me It's time to shine"
Superhero . . . this is my grandson's favorite song; "I'm a superhero flying around, No need to worry you're safe and sound, Battling evil, fighting for good, I'm a superhero in your neighborhood, Battling crime I'm in my prime, There when you need me every time, Undercover in disguise, BOOM! Here I am - surprise!, It's ok, have no fear, Don't be afraid, help is here"
Rise and Shine . . . "Rise and shine and give God the glory (3 times), Children of the Lord, Rise up and shine, Rise up and shine and give God the glory, Rise up and shine, Rise up and shine children of the Lord, With the light of day, I am wide awake, I’ve got something to say, I am not afraid, Look out world, Here I come, Your Word I read, Like the air I breathe, Gives life to me, I am free, With nothing to hide, I am ready to shine"
Worthy . . . "Gonna shine my light, Gonna make the whole world bright, With the love of my King (repeat), For only He is worthy, Of my glory and my praise, I will serve Him faithfully, Every single day"
All for You . . . this one is my favorite; "I wanna live like I’ve never lived, Give like I’ve never given, Run like run I’ve never run for You, I wanna love like I’ve never loved, Sing like I’ve never sung, I wanna tell the world about You, It’s all for You"
I'll Fly Away . . . "Some glad morning when this life is over, I’ll fly away, To a home on God’s celestial shore, I’ll fly away, I’ll fly away oh glory, I’ll fly away, When I die hallelujah by and by, I’ll fly away"
My grandsons LOVE this CD! They started making their own "dance routines" when they listened to Shine and Josiah told me he thinks all children will love these songs . . . I agree; and so will the grandmas! As I mentioned above, not only did Go Fish send this CD for me to review, but they are making another available for me to give away on February 20, 2014 (USA only)! So . . . if you are over the age of 18 you may enter by commenting below to let me know your favorite story about your grandchildren being "superheros" . . . mine still has to be when he was four years old and we gave him a "superhero cape" . . . he "flew", "around my house singing, '♫♥♪ Super Josiah is here ♫♥♪ to save the day! ♫♥♪' Josiah told me right now he just pretends to be a Super Hero, but when he grows up he will be a Super Hero for real! Did I mention he has a 'super' imagination? Of course I did the only thing I could do . . . I sighed a HUGE sigh and said, 'Okay. I'll be brave.' What else was I to say? And yes, we went and fought giant, robot spiders! Josiah told me we were successful in our fight with these horrible creatures . . . and he said we were, 'brave'!!!!" So, what is your favorite grandchild superhero story? Additional entries in this give-away are available if you follow on Google+, Google Friend Connect, follow by liking on facebook with the tab at this link (not just liking the post) and/or have followed grandma's cookie jar by email. For each of these which you have done you will receive one entry. In addition, if you "share" this post, you'll receive an additional entry (please let me know if you share!) This will help me be able to draw names from among people who would like to win Shine and it gives you several ways to enter the give-away! Thank you for reading grandma's cookie jar and for sharing it with the people you know! When my 4 year old grandson received his Batman costume he wouldn't take it off. I follow on fb and email.